The D.R. Congo’s Permanent office of investigations of aviation Accidents/Incidents released the final report of their investigation into the 2011 fatal accident involving a U.N. chartered CRJ-100. The report, obtained by the Aviation Safety Network, shows windshear the accident cause. On April 4, 2011, a CRJ-100ER passenger jet crashed during a go around at Kinshasa-N’Djili Airport (FIH), D.R. Congo. One passenger survived, 28 passengers and all four crew members were fatally injured. 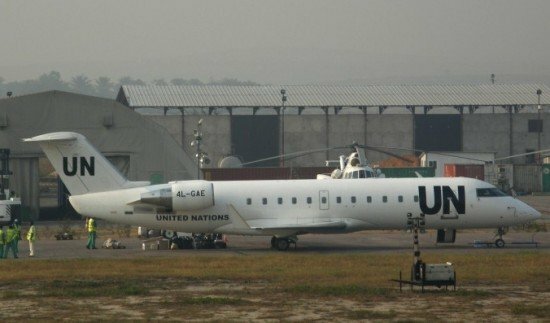 The airplane operated on behalf of the United Nations Organization Stabilization Mission in the Democratic Republic of the Congo (MONUSCO) on flight UNO834, a round trip from Kinshasa-N’Djili Airport (FIH) to Kisangani (FKI). The CRJ-100ER was chartered from Georgian Airways and manned by a Georgian crew. The aircraft took off from Kisangani for Kinshasa at 12:18. The pilot in command was the pilot flying on this leg. At 13:31, the crew reported to Kinshasa Approach that they were 137 NM from Kinshasa. Weather at the time was reported good at the Kinshasa airport with a visibility 10 km. However, Cumulonimbus clouds (CB) were present at 3000 feet to the North East and South East of the field. At 13:49, when the aircraft was about 32 NM from Kinshasa, the crew again obtained latest weather information which read: “wind 210 degrees, 8 knots, visibility 8 KM, thunderstorm over the station, scattered cloud at 2500 feet, few Charlie Bravo 3000 feet, Charlie Bravo located north-east, south west and west, broken 12000 feet, temperature 33, dew point 23, QNH 1008, trend NOSIG”. One minute later the flight was cleared for a straight-in Localizer approach for runway 24. The crew discussed options of avoiding the severe weather being displayed on their on-board weather radar by skirting around the radar returns. The aircraft approached the airfield at high speed. The indicated air speed came below 250 knots at 13:53 when the aircraft was descending through an altitude of 4630 feet and was 13 NM from threshold runway 24. While intercepting the Localizer for runway 24, the aircraft remained to the south (left) of the Localizer path. During the execution of the Localizer Approach, the crew made a more than 15 degree heading change to fly even further away from the Localizer path when the aircraft was between 10-7 NM from runway 24. As the aircraft came close to the airfield, the co-pilot sighted the runway on his right one o’clock position, when the aircraft was about 9.7 nautical miles from displaced threshold of runway 24. The PIC too, sighted the runway when the aircraft was about 6.4 NM away from threshold. At that stage, the aircraft speed was 210 knots, altitude was 3250 feet (or about 2252 feet above ground level) and the aircraft was in clean configuration. The crew decided to continue their Approach. The captain disengaged the autopilot, turned towards the runway and gave instructions to co-pilot to configure the aircraft for landing. The crew managed to regain Localizer path and align the aircraft to the runway by the time they were 2 NM from the threshold. At around this time, Kinshasa airfield was affected by a squall line. As the aircraft came on short finals, it encountered rain. At this stage, the aircraft was below the Minimum Descent Altitude (MDA) for Localizer Approach for runway 24. The crew switched on wind shield wipers. As they descended further to about 224 feet AGL and runway was not in sight, the crew decided to carry out a go around. A positive rate of climb was established with appropriate airspeed. While climbing through an altitude of 1395 feet (or 397 feet AGL); the aircraft encountered a severe weather phenomenon (probably a microburst). The wind shear warning came on. The aircraft pitched significantly nose down (from about 4-5 degrees nose up attitude to 7 degrees nose down attitude) in a very short period of time. The aircraft rapidly lost height. Before the crew could react to the pitch down and recover from the steep descent, the aircraft impacted the terrain. The airplane broke up and the main wreckage came to rest upside down. The most probable cause of the accident was the aircraft’s encounter with a severe Microburst like weather phenomenon at a very low altitude during the process of Go Around. The severe vertical gust/downdraft caused a significant and sudden pitch change to the aircraft which resulted in a considerable loss of height. Being at very low altitude, recovery from such a disturbance was not possible. The possibility of a somatogravic illusion caused Loss Of Control (LOC) as the primary cause of the accident, was also discussed by the investigation team. This was ruled out based on available evidence which showed that during the Go Around, the crew had initiated the climb at 1256 32 and had thereafter, maintained a climbing attitude for the next 12 seconds. At 1256 44, the aircraft experienced a sudden and steep nose down attitude change without a corresponding control input by the crew (as shown by FDR), Hence, Somatogravic Illusion caused Loss of Control was ruled out as a cause of accident. 1. The inappropriate decision of the crew to continue the approach, in face of extremely inclement weather being displayed on their weather radar, was probably the principle contributing factor responsible for the accident. 2. Lack of adequate supervision by the Operator to ensure that its crew complied with established procedures including weather avoidance procedures and Stabilized Approach criteria, was a probable contributing factor. 3. Inadequacy of Georgian Airways Training program for upgrade to Captain was a probable contributing Factor. 4. Lack of effective oversight of Georgian Airways by Georgian CAA was a probable contributing factor. 5. Lack of appropriate equipment at Kinshasa airport for identification and tracking of adverse weather phenomenon, resulting in failure by ATC to provide appropriate early warning to the aircraft, was probably a contributing factor. 6. ATC not declaring the airfield closed when visibility dropped below Minima was a probable contributory factor.